The thing that will make people pick up Kip Fulbeck’s Paper Bullets is that it’s about a guy who grows up hapa (half-Asian) in America. But that won’t be what leaves the deepest impression. The book’s you-are-there tone is accompanied by a kind of pop-culture soundtrack—dozens of quotes from songs, movies and TV shows scattered throughout. They’re not marked as quotes in the usual way and they’re not credited until the end notes; they float in, much as they’d come to mind in real time. 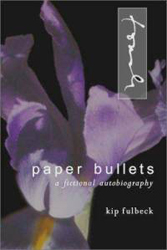 As you might expect, Paper Bullets offers insights about specifics such as Asian-American identity and being a young man in America. Its true source of power, though, is the ring of truth in its everyday, universal experiences. While much of the writing is darkly funny, you can turn a corner in this book and get hit right between the eyes with Fulbeck’s raw evocations of alienation and longing.